Citizen lobbying is one of the most active programs of the League of Women Voters. You don't have to be in Olympia to help the advocacy efforts in Washington State. Our Lobby Team issues Chairs work hard to cover the issues and rely on people across the state taking action. We would like to see them assisted by volunteers who would work behind the scenes and from their home to advance our positions. 1. Sign up for the legislative newsletter here. 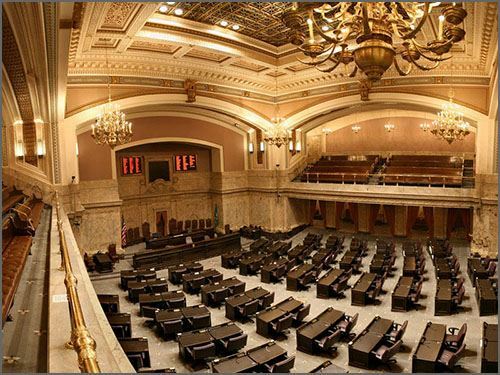 Don't miss out on the opportunity to hear about the latest developments at the Washington State Legislature. You will receive an email every Sunday during session with updates on our issues and relevant actions for you to take. The League works on many issues and picking a specific issue to volunteer on is a great place to get started. While you might personally care about many of the issues in Olympia, is there a specific field that you would like to dedicate your time to? Giving yourself permission to focus is a great way to prioritize your time and help us move it forward. For a list of the LWVWA top issues please see our issue pages. 3. Think about your skills and expertise. League volunteers research bills, draft social media, design graphics, coordinate events, educate their community, and organize volunteers. Think about your skills and background. Is there something you are particularly good at or a skill you would like to work on and improve? Many hands make light work, and there is always something to do. 4. Contact us to get connected. Ann will be in touch with you to follow up on your interest. If you have general questions, please contact the League office at info [at] lwvwa.org. Thank you for volunteering with the League!